Celebrated blues rock master Joe Bonamassa delivers a musical tribute to The Three Kings Of the Blues (Albert, Freddie and B.B.) at the legendary Greek Theatre - filmed in August 2015. 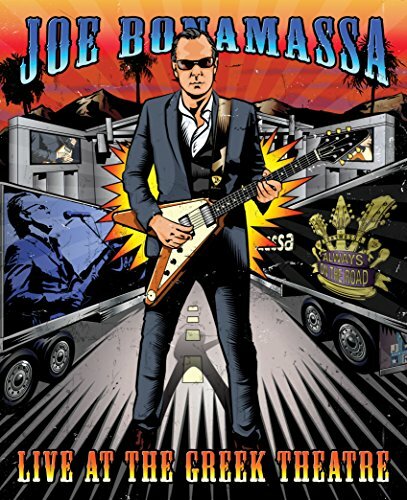 Bonamassa is backed by a stellar band of blues musicians including Anton Fig (drums), Michael Rhodes (bass), Reese Wynans (Keys), Lee Thornburg (trumpet), Paulie Cerra (saxophone), Ron Dziubla (saxophone), Kirk Fletcher (Guitar), Mahalia Barnes, Jade MaCrae and Juanita Tippins (Vocals). PBS will air in over 50 markets. US fall tour dates 11/15-12/17 followed by a Spring tour which starts in Feb 2017. Bonus features include: Growing Up Joe - A Conversation with Joe's Parents, Riding With The Kings Official Music Video, behind the scenes footage and photo gallery.